FindYourNet.com - Hair salons, health spas, maids and day cares. Hair salons, health spas, maids and day cares. All templates are optimized for any screen resolution. Your website will look great both at widescreen desktop computer and small phone screen. Simply make your selection and the rest is already done for you. We do our best to make all templates clean, nice and neat. Your visitors will concentrate on your page content instead of fancy design elements. We know what's important to you, and we focus on that. When you register with us, you don't just get a website. 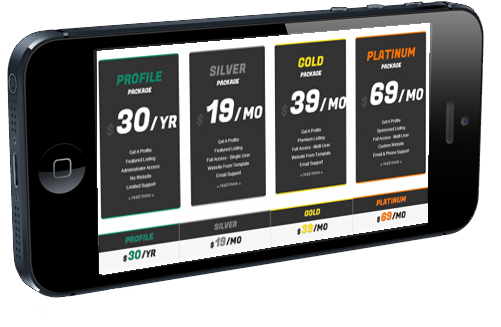 You get an online business suite in one tidy box. What are you waiting for? Try us out now - we promise - you won't be disappointed. This offer is trully one of a kind. You will not find a single company who will offer the same amount of service. Your website will look amazing with state of the art technologies, and you will be able to control it with ease. And all of it at a very low price. 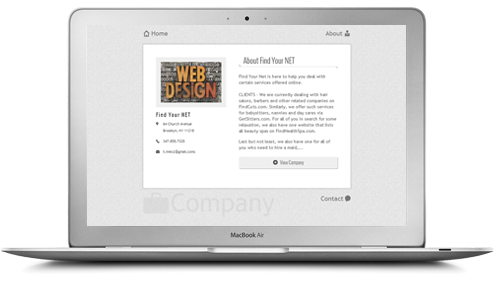 All of our templates are designed with current technology and are updated constantly to keep ahead of the competition. Not only will you have access to prebuilt useful pages for your company, but you will be able to add pages with ease. Don't have time to write content and pick images? No problem. We have pre-selected content that might suit your needs. We're always standing by to lend you a helping hand. We will assign an advisor to help you get everything up and running. Find Your Net is here to help you decide what's best for your business. FindYourNet.com - Hair salons, health spas, maids and day cares. Search for hair salons, health spas, maids and day cares online by ZIP code. Register online and schedule your appointment, all in one place. Find Your Net is here to provide online services to any business at a very low cost. If you are looking for a low cost web solution then you are in the right place. We specialize in the specific types of companies, as listed below, but we also offer services to other companies. Let us briefly describe the difference. Specialty websites come with online profiles used for researching and as an additional informational section. On top of that, all specialty websites include options for appointment scheduling, which may still be used in other websites upon owner's request, but is not available as a standard. Lastly, specialty websites come with content sections that get updated constantly. You will get articles and suggestions for anything else that you put on the website, including descriptions, blogs, faqs and more. 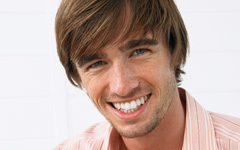 Specialty websites - We are currently dealing with hair salons, barbers and other related companies on FindCuts.com. Similarly, we offer such services for babysitters, nannies and day cares via GetSitters.com. This one is probably the most popular one of all and it involves health and beauty spas and salons: FindHealthSpa.com. There isn't any specific order to that, so weirdly next on the list are exterminators and pest control services over at ThePestService.com. Another one is for psychologists and psycho-analysts, but it also involves large groups of marriage counselors and more over at FinsShrinks.com. There's also one website for driving schools over at GetDMV.com. Last but not least, we also have one for maids, or any other home cleaning services at Maids4You.com. You will also find deals in the sidebar for all the greatest deal sites, such as Google Deals, Groupon, Yellow Pages, Living Social, Yelp, and our own FindYourNet coupons, that we offer for all of our clients. We offer a large variety of services for all your needs. From website hosting, to appointment scheduling. From client management to email tools and templates. From social media connectivity to feeds from deal pages, and much more. And above all, we offer information feed to our own websites. Visit any of the websites listed above to contact us or to use the services that we provide you with. We are here to help your company work out all the kinks in your online presence. Our advisers will help you first with your own website and will continue giving you suggestions on what to do next to improve your existance on the web. We are continuously building tools that will automate and help you succeed online. Jump start your company by registering with FindYourNet.com. Find out more by reading what we have to offer or browsing our blog. We are always eager to answer any other questions you might have about our hair salons, health spas, maids and day cares type services, so feel free to contact us at any time. Posted on April 27, 2012, We're Coming!, in FindYourNet.com blog page. We are proud to announce that we are in the final stages of Alpha testing. Starting May 5th, or Cinco De Mayo) if you prefer, Find Your Net is taking its line of products public. That means exactly what you thing it does. Starting May 5th anybody can register to become a member of Find Your Net family. We are offering a wide range of service. Current software version at the time of release will be FYN 1.5b. Note that this software is updated DAILY. With each larger release we bump up the version of the software and give you the release notes of what has been updated. Our developers have many ideas to improve your online interaction - and many of them will be converted into fine programming that will make your life easier and your company more successful. As mentioned earlier - we still have plenty ideas on what to do next, and our priority is to add as many options as possible, however we want to add only these elements that will be utilized by our clients. We select the best ideas and put them in the pipeline. If by any chance it happens that we run out of ideas (which does not seem likely in the near future), we will utilize that extra time for template development. Speaking of templates, did you know that as a member of Find Your Net family, you are entitled to every single template that we build? And guess what! Not only are they free to use, it takes one click to change between them. Want to try a new look for your website? It is one click away. Our bi-monthly newsletters will explain all the newly added features to the system, as well as demonstrate any new templates that may have been created. We would be happy to have you amongst us! Join us now, or take another look on the things that we have to offer. This list is not full, so you may want to visit our tutorials page, or just register anyway to get your 1 day free trial. Look around test things for yourself and if you're not amazed with the things you see, simply cancel your subscription and you will not be charged a penny. Find Your Net welcomes you! Posted as a courtasy of Find Your Net on FindYourNet.com in the terminology section. Member Preferences Remember Username: This option, if enabled, will remember the name of the user on the login screen. Not recommended if multiple users are accessing the administrator from the same computer. Try FindYourNet.com Free of Charge for 7 day. 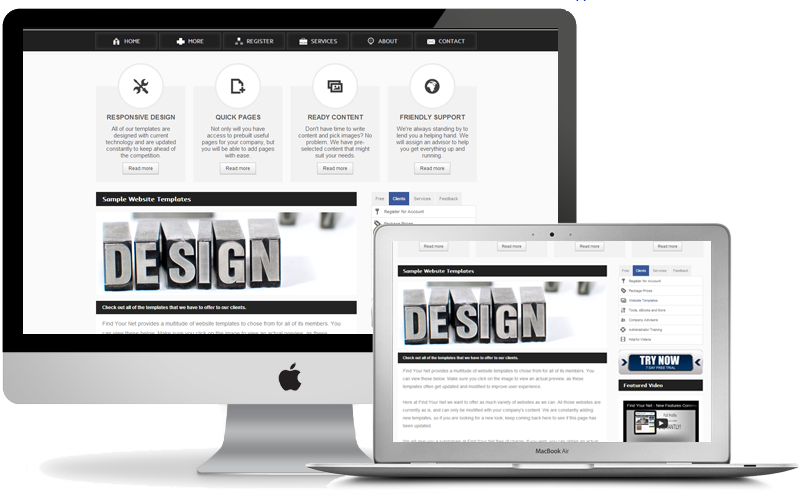 Find Your Net web design service is a very professional organization that puts the customer first. The service is superb, fast and accurate. We have been with them for several years now, and would not think of going anywhere else. Do you build Facebook pages? Quick answer is no, however we do offer Facebook page tab content. If you are not familiar with what this means, you should read through our Facebook Part 1 and Facebook Part 2 articles. The first article explains how to creat a facebook page, the second helps you set up a page tab that would be driven via Find Your Net network. All steps are well demonstrated.